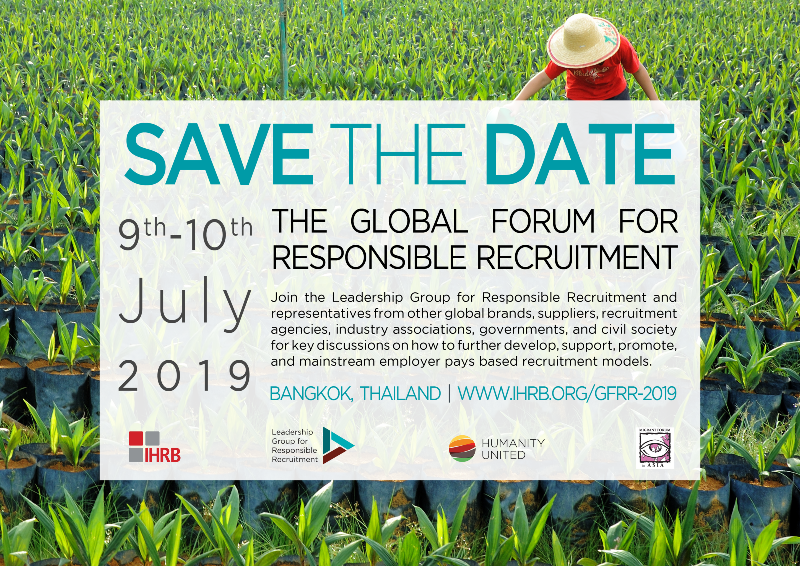 The third annual Global Forum for Responsible Recruitment will take place in Bangkok, Thailand on the 9th–10th July 2019. Significant progress has been made towards an increasingly global priority to ensure ethical, professional, and transparent recruitment of migrant workers – although many challenges remain. Join members of the Leadership Group for Responsible Recruitment and representatives from other global brands, suppliers, recruitment agencies, industry associations, governments, and civil society for key discussions on how to further develop, support, promote, and mainstream ‘Employer Pays’ based recruitment models. This business-focussed forum will be of interest to supply chain managers and buyers, sustainability professionals, human resources managers, suppliers, recruitment agencies, civil society and intergovernmental organisations and representatives from government. See the Agenda Preview for an insight into the key topics and discussion points. The annual Global Forum for Responsible Recruitment is a key mechanism to promote, develop, and accelerate action toward mainstreaming the responsible recruitment agenda with business and government. These business-focussed fora also provide a platform for many other organisations to showcase their work and ensure alignment and cooperation. This catalyses collaboration between different organisations and supports the coherence of consistent and amplified messages going to brands, suppliers, recruitment agencies, and governments. If you would like to join the mailing list for the Forum and keep up to date with the latest news and registration details, please email neill.wilkins [at] ihrb.org with your i) name, ii) organisation, iii) position, and iv) country of operations.